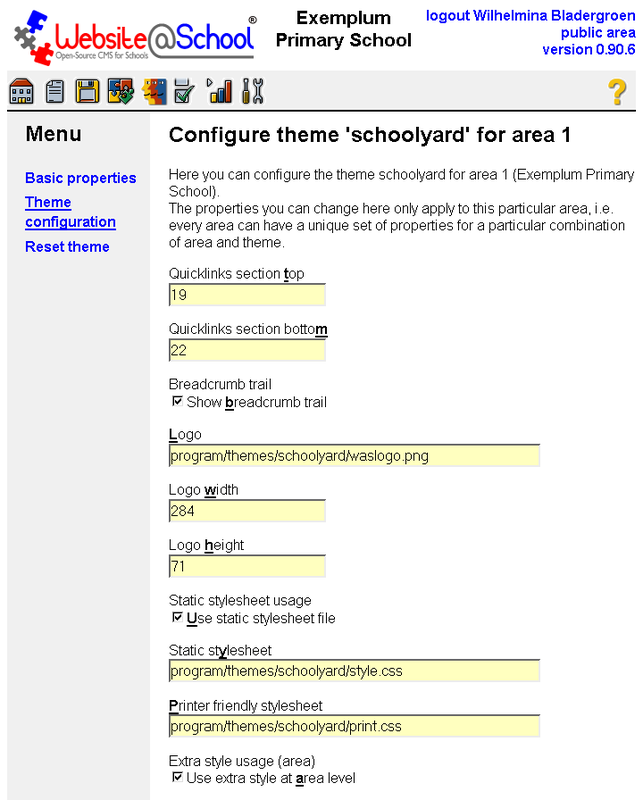 Schoolyard is a classic theme, however with many options to change what the visitor of a website will perceive. For its features, please see paragraph 2.2 Theme configuration. Tips for this theme are discussed in 3. The theme in practice:tips. 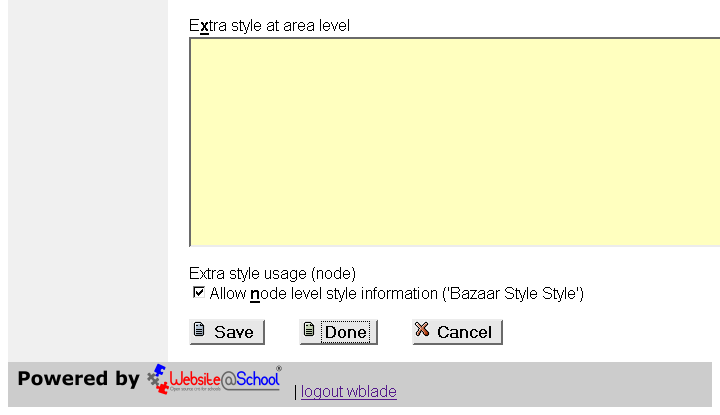 Schoolyard is an 'inverted L' theme. That is, the character 'L' turned clockwise for 90 degrees. In that way, the long side of the L is the header, the short side the selectable sections and pages. The header of the theme takes about 10 percent of the screens top horizontal space. 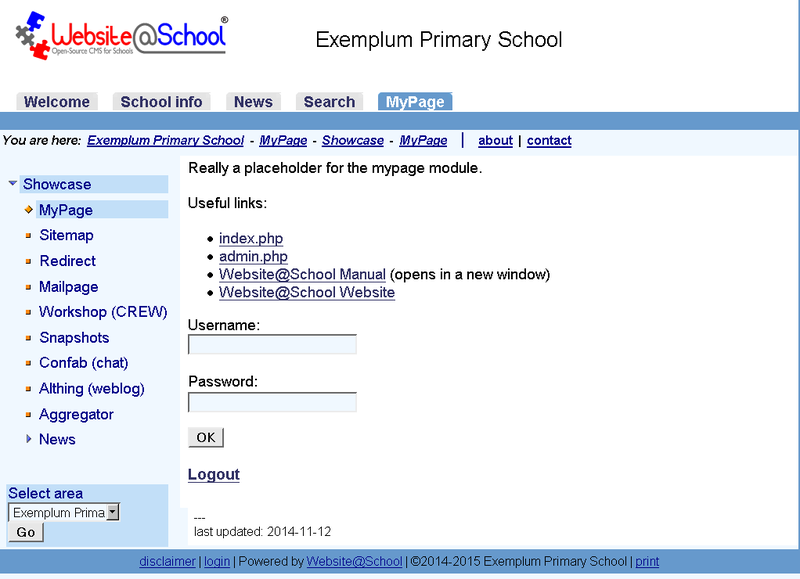 In the header are, on the left side the Website@School logo, in the middle is the centered Area title 'Exemplum Primary School'. Below the header is the navigation bar with the section titles: 'Welcome', 'School Info', 'News', 'Search' and 'MyPage'. Below the navigation bar, from left to right, a thin colored bar of about 10 pixels high. Under the thin colored bar is, directly starting from the left side, the 'You are here:' breadcrumb trail. Under the breadcrumb trail, the space is divided in two parts. On the left side is a vertical space of about 15 percent of the screen width. It contains from top to bottom the page(s) and (sub)sections and the 'Select Area' dropdown menu. The remainder of the screen width, about 85 percent is page content. At the bottom of the theme is a horizontal bar of about 5 percent of the screen hight with several items, separated by the pipe symbol '|'. From left to right: The bottom links 'disclaimer' | 'contact' | 'Powered by Website@School' logo | © <yyyy-yyyy-yyy> | Exemplum Primary School | 'print' link. Printer friendly stylesheet: Default: program/styles/schoolyard/print.css The print link produces a printer friendly version of the page. That is, only page content and the 'Last updated <yyy-mm-dd<' line.